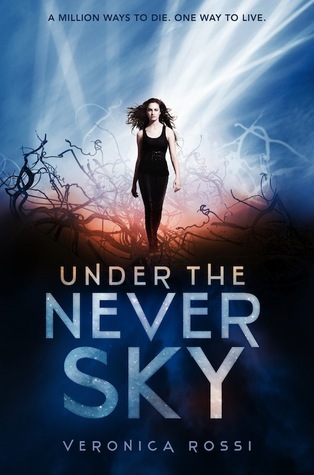 Review: Under the Never Sky by Veronica Rossi - Book.Blog.Bake. The characters, Aria specifically. They were easy to relate to and had strong motivations and desires that prompted their actions. Their actions never seemed forced or unrealistic. I like Aria’s growth through the book, how she realizes she can survive in the world outside. Perry was a intriguing character as well. I didn’t like him as much as I thought I would, but he was a well-written character. The plot was fairly interesting. I was involved and the story and the characters. I liked the addition of the strong senses and the cannibal tribes, which were rightly terrifying. The little bit of the book that took place inside the pods. This was so interesting, and what I wanted more of! I want to know about these pods. How did they come to be? What exactly has happened that force a society to live in these pods? We get a little bit of this, with the explanation that the Aether storms drove humans inside, but I wanted more, and I ate up every word where I did get to explore this world. The Aether storms. The description of them leaves quite a bit up to the imagination, but in my mind they are incredibly beautiful and incredibly beautiful. I like the addition of these massive lightening-type energy storms. Like I said, I did really enjoy these aspects of the book, but there were just a few things I couldn’t overlook. I’m not convinced of the romance yet. I like both characters individually, and while I do applaud the rather mutual romance that’s going on here, I just haven’t bought it yet. I’ll probably read the future books and I hope it’ll grow on me, but so far the romance is a no-go. And my biggest disappointment with this book, which takes it from a potential 4 star down to a 3 star review is the world. There is so much interesting things that could be explored in this world that’s been built, and I want to know it all. The whole concept of smarteyes and the pods and the storms just left me wanting more, but not necessarily in a good way. This had the potential to be an insanely interesting story based on the unique world alone, and I feel it just kind of fell flat for me, because instead of the world we get a much narrower story. Final Impression: Decently good, but not great. Interesting enough that I do empathize with the main characters and will finish the series, but not enough that I feel the need to excitedly converse about this book with others. The writing is good, but I want more of the world. 3/5 stars. Really don’t know whether to read this book! Heard so much about it. It’s on my dystopia ‘to read’ list after Legend and The Maze Runner. Great review. I’d definitely recommend it. I thought it was a good story, though not wonderful, but so many people love it. I’m actually reading The Maze Runner right now as well! I have personally read Under the Never Sky and my review is like yours, though I had given it a four stars instead. I really liked the plot of Under the Never Sky but I feel like it is missing some stuff to make it more interesting. I’m so glad I’m not the only one who feels this book lacked a little. I still thought it was good & enjoyable, but by no means great. Thanks for stopping by & commenting!